Try this hearty Cumberland Tattie pot recipe by Craig Hennessey, Pub Pie Champion 2011. 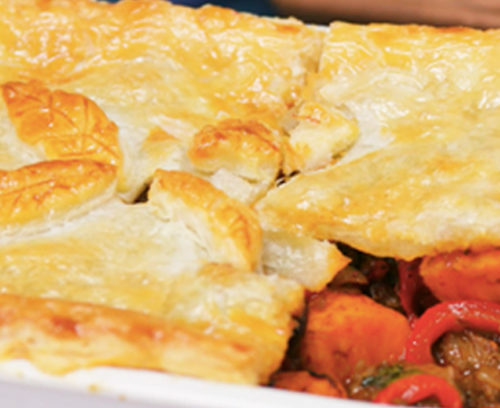 Made with Jus-Rol shortcrust pastry, serve with braised red cabbage. Served in 10cm circular pie dishes. Fry the shallots in the butter until brown, then add the garlic and half the sage and thyme. Once cooked, add the lamb stock and bring to the boil and simmer. Dust the diced lamb in the flour and fry in a pan with oil and a little butter. Once browned off, add to simmering stock and cook for 2 hours. Add the diced carrots, potatoes and rest of the fresh herbs. Season and simmer for a further 30 minutes. Dice the black pudding and place on a baking tray and cook for 15 minutes at 200°C. Once cooked, add the black pudding to the stock and remove from the hob. Spoon the mixture evenly into 5 individual 10cm pie dishes. Glaze the top with beaten egg and place in the oven for 25 minutes or until the pastry is golden brown. Serve with braised red cabbage.